Overall this book was... sweet, kinda, but really immature. This should be in the Young Adult section. I tried to finish it but i honestly couldn’t because it was just way too much. Not realistic - i know books are an escape but this was just... a lot. I’m a lover of romance and i liked some pieces and points to it, but it just got overplayed very quickly. This guy is OBSESSED with the main character and it’s cute at first but then it consumes him and becomes his whole identity - which is really incredibly high-school like some reviews below say. His obsession is down-right annoying. The performance was alright - i gave 4 stars because she changed her voice for the male characters and it wasn’t forced or weird. She has a really raspy voice, so I’d keep that in mind if you’re fickle with voices. The story was again, alright, nothing of real substance everything is really odd and “out there” even for a non-fiction book. I didn’t finish and ended up returning it. !! *** First off, this book details abuse in a romantic relationship (and touches on child abuse) - if this is something you've experienced or you're sensitive towards, I recommend you don't listen *** !! So insightful, it gives a look into the mind of the abuser - how they think and how they rationalize their actions. It's got a little taste of that "rich kids in high-school" setting. Very little "dirty" moments - the scenes that may be deemed "dirty" have very little details (I'd rate it PG-13.) There is a moderate touch of romance, how he thinks of this girl, the things he says, etc. but it's easily displaced with his actions. There is wonderful character development and the book is so well-balanced - touching on his past and re-focusing the listener on his present. It never gets boring. Also, Jon Cryer's voice is just perfect - his tone, pronunciation, make the book really easy to listen to and not at all boring. I really wish he narrated more books. Alright, so I'm not done with the book yet but I felt like I needed to put in a review - reading the reviews before purchasing almost swayed my choice. Here are a fee of the things I've noticed so far and I am interested and do plan on continuing and possibly listening to the rest by this author. 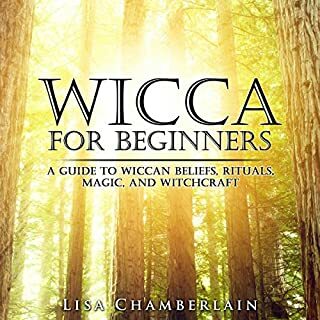 Information: This book is FULL of information for anyone that is eager to practice or just curious, there is a lot of details about origination, and it is very beginner friendly, everything is broken down into process-able pieces for the mind. It's full of good stuff to get your started. 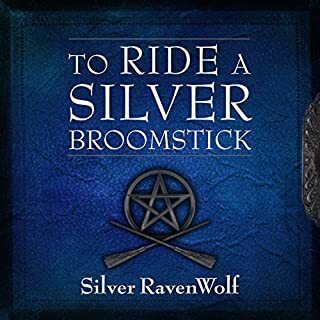 I would definitely recommend this book to someone who is okay with monotone narration, someone who is interested/intrigued by wicca/witchcraft and looking to possibly begin practicing. It's a very good "square 1." 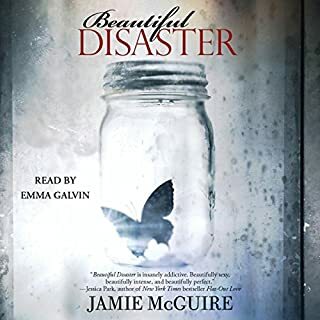 It is full of adventure, a very smalllllll, tiny dash of romance, but most of all it had a lot of stereotypical “damsel in distress that’s too stubborn to be saved but ends up beating all odds” feel which may be “feel good” to some readers. The main character is predictable although the story itself has a few twists. It kept my hold for about 7 hours but with 2 hours remaining the narrator along with the storyline just didn’t hold me anymore - i knew what was going to happen and googled it just to confirm. Detailed book / cons and pros: book is full of details, which may either paint a picture for you, or may confuse you a little bit down the road if you weren’t paying full attention. I wouldn’t select this book to listen to if you’re someone who wants an “easy listen” you really need to pay attention. I had to start the first 3 chapters over again after just having listened to them because i missed so much. Names and places / cons and pros: The places in the book and the names of the characters can be difficult to remember, so keep that in mind. I personally don’t mind it but me not minding it even gave me a bit of a headache and a “what/who is that?” At times. But if your mind is sharp and you like the extra attention to detail it does add layers to the story. Narrator - the narrator had a distinct “static” sound behind her. Her accents changed per character but sometimes she’d slip and create a new accent or didn’t hold it for long enough so it was somewhat difficult to keep tabs on who she was speaking as during some parts. Her voice even went into a different tone at times and that was confusing, almost sounding like a child. There are few times were she mispronounces a word she had just pronounced correctly. To be fair the book has a lot of “foreign” sounding names and places. But for instance she would refer to one character as “Jenny” and next it’d sound like “Ginny” so, if you’re picky maybe pass on this book or try to get through it. It doesn’t happen often but it happens. Also at the beginning of some chapters you hear a slight throat clearing. Finally - In my opinion, the book is just fine i will not continue the series. It started getting dull and repetitive towards the end. 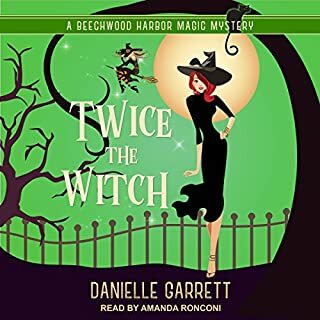 Jealousy is rearing its ugly head in Beechwood Harbor as Holly contends with her new roommate and popular paranormal soap star, Evangeline Loren. Especially when the new witch in town turns her flirtatious smile towards Adam St. James, Holly's newly minted boyfriend. But before she can wrench Adam from Evangeline's clutches, she has an amnesiac ghost begging for her help and finds herself smack dab in the middle of another murder investigation in the small town. 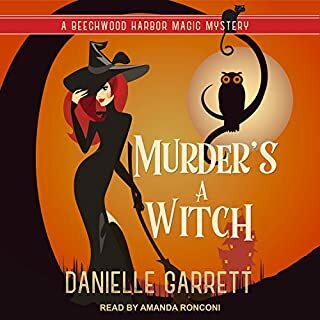 Holly has to track down the murderer and save her relationship...all without landing herself in a witch's duel. 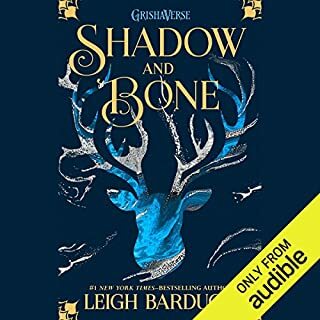 I really loved the first book, so I was SO excited to give this one a listen. Without any spoilers or going into detail, the story is soooo repetitive, the whole book is based on just 1 single and solitary event, it branches out ever-so-slightly, but always comes back to this 1 single event, which is fine, but it gets boring so quickly, nothing else is really added to it - there's no "zest" so to say, there's no romance to balance out the constant "running-around-solving-this-crime" the WHOLE THING is "running-around-solving-this-crime" - the book is very light-hearted but there's no extra comedy to switch it up and take away from that just SOMBER and "crime-solving" theme. There was so much going on in the first book, there was a "main event" basically, but it wasn't continuously focused upon, there were other stories, other characters coming in and out. Very little romance, but enough to kinda get a breather, which was so great. I feel like this one just dragged on and on and on. 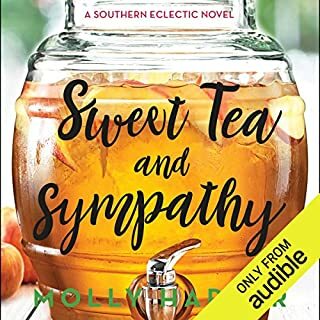 The main character (Holly) really irritated me in this book because she's just agitating - she literally gets sucked into this "crime solving" and doesn't leave room for anything else and she's just SO BLINDLY CONSUMED, she's neglectful honestly and there's so much that could have been done with her personal life - SO MUCH MORE COULD'VE BEEN ADDED!! It was so hard to finish this book - it's only 6 hours or so which I can usually knock out in a day, but this took me about a week to complete. First off - I love the Narrator - Amanda. Secondly, the book is so absolutely adorable, I love how the main character changes throughout. I love the small touch of romance - it's not overwhelming or "too much" like a hormone fueled YA novel. The relationship and family aspects of the books are sooooo realistic. Just a great book, very sweet and easy to listen to. I love books like this. His voice is soothing. It's very to the point and straight forward, there's no sugar-coating or adding redundant details. 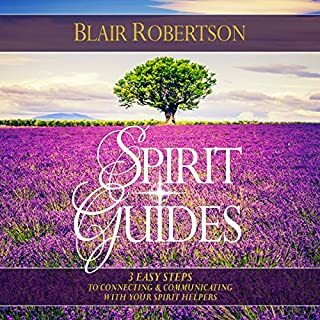 It is very beginner friendly and even friendly for someone who knows about spirit guides, it kinda solidifies certain ideas + even gives some more points + ideas for connecting with our guides. 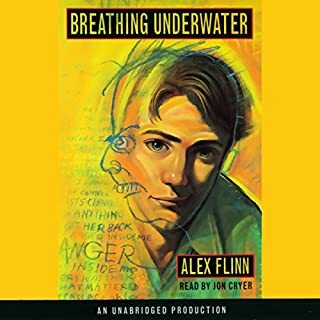 I only gave it 3 stars for Overall + Story because I couldn't get past the 1st chapter where the author was talking about themselves - that turned me off a bit, also because the book kept mentioning a link and a guided meditation but there was no such thing in the library, I would have loved to see it. It wasn't the PERFECT book. Otherwise, this was a great book + it's short so I will most likely be listening to it again once I want a spirit guide refresher. It kinda brings me back down to step one and re-energizes my beliefs. It's such a cozy-supernatural book! It's such a sweet book, very cute, the narrator is wonderful - she giggles and laughs when the line calls for it and it's so natural and perfect. The book has lovely details but they're not redundant. 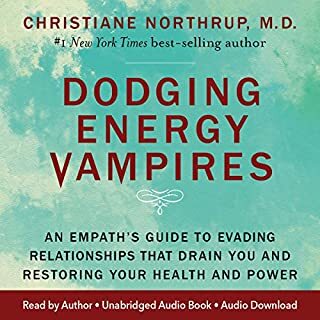 Her voice is so soothing and relaxing, it's perfect for this book - she explains things in a medical sense and then re-explains it in layman's terms so I literally understood every fancy medical word. She uses a lot of examples and never really repeats points unless it's relevant or necessary to make connections. Love this book - will definitely listen again.